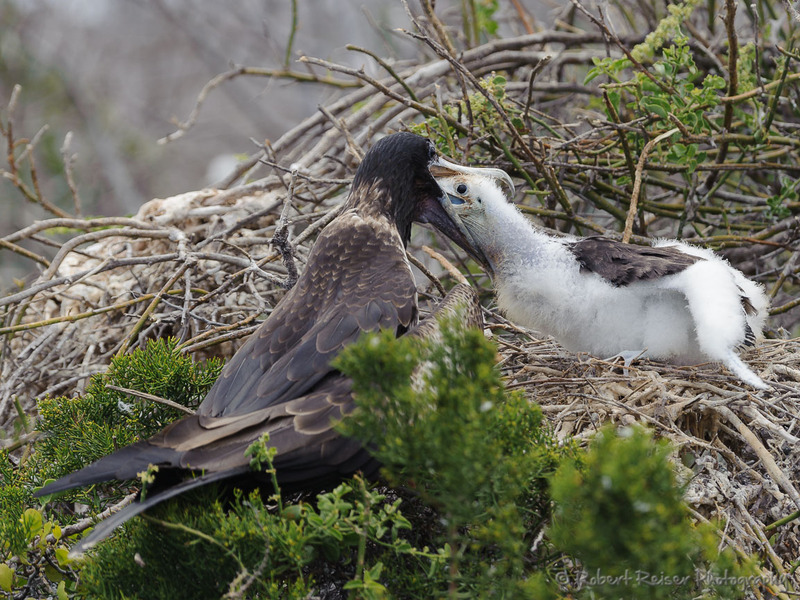 These Frigatebirds are one of the Galapagos symbols, also used by their airline. 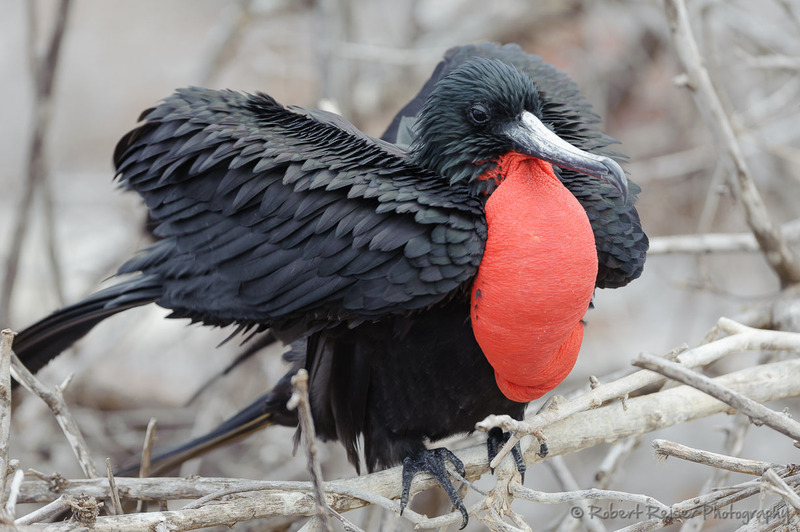 The males have this impressive scarlet throat pouch which is used in the mating season to attract females. 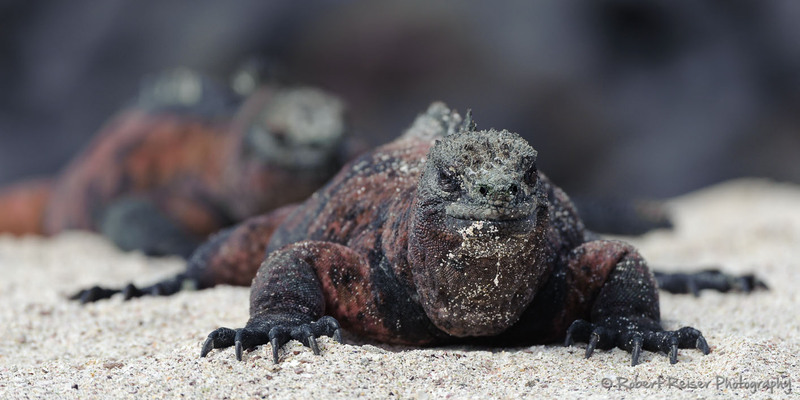 This Iguana looks as if it was slightly amused by the number of tourits surrounding it... minutes ago, it had enjoyed a bath in the sand. 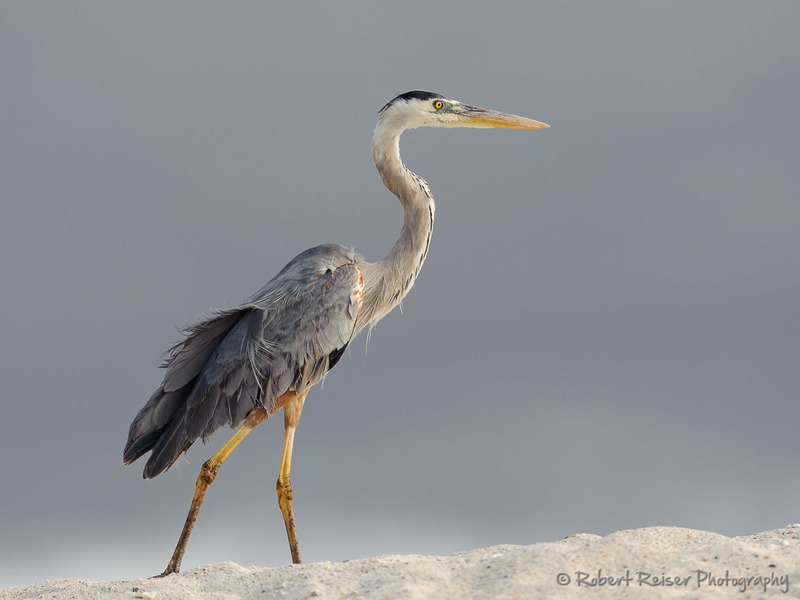 These birds look really clumsy on land, but when they fly they are elegant and very impressive. 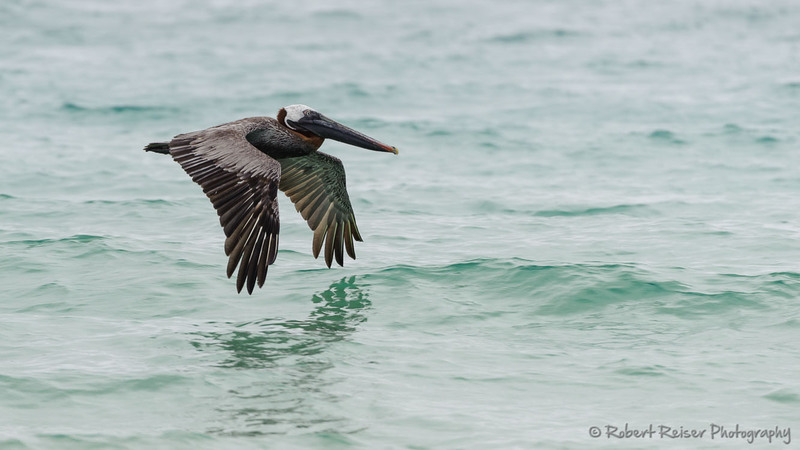 In flight, they nearly touch the water surface. 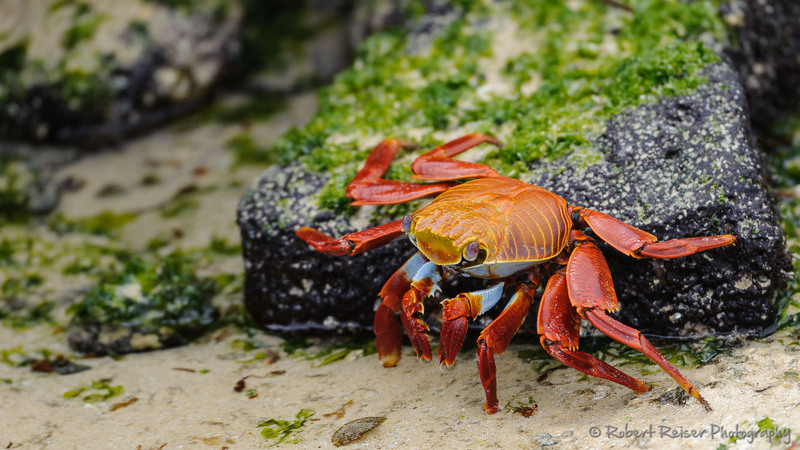 Although hundreds of these crabs can be seen on every Galapagos island, I like this picture because of the red-green contrast. 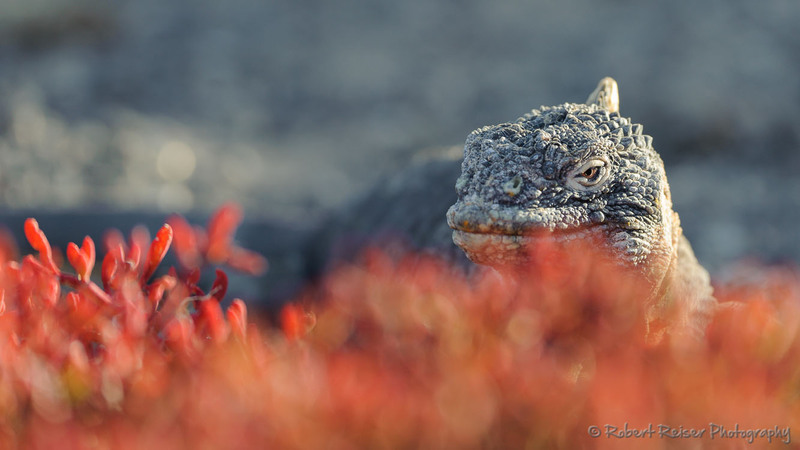 The beautiful red vegetation offered itseld as a foreground of this Iguana picture, with the evening sun enhancing the warm color. 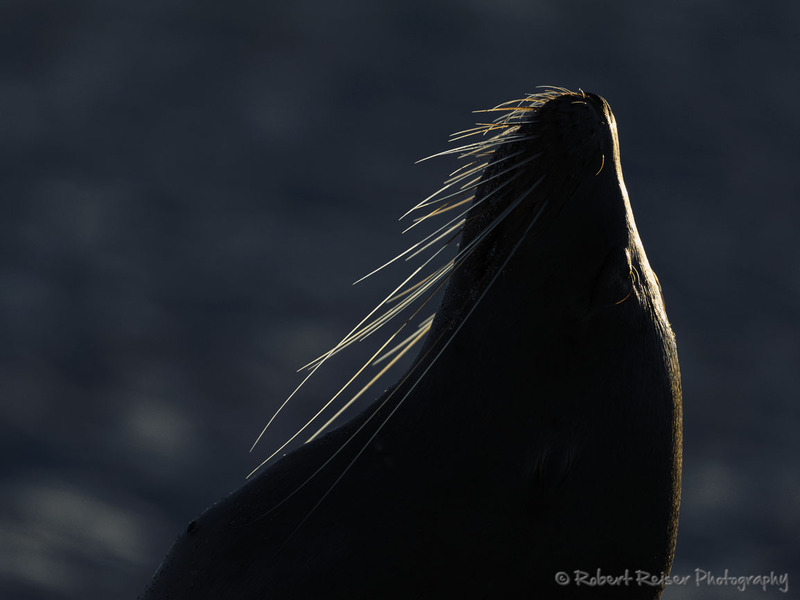 Right after sunrise, this seal raised its head and for a while, it remained quiet and motionless, enjoying the first warm rays of the sun. What Is Wrong With Your Feet? 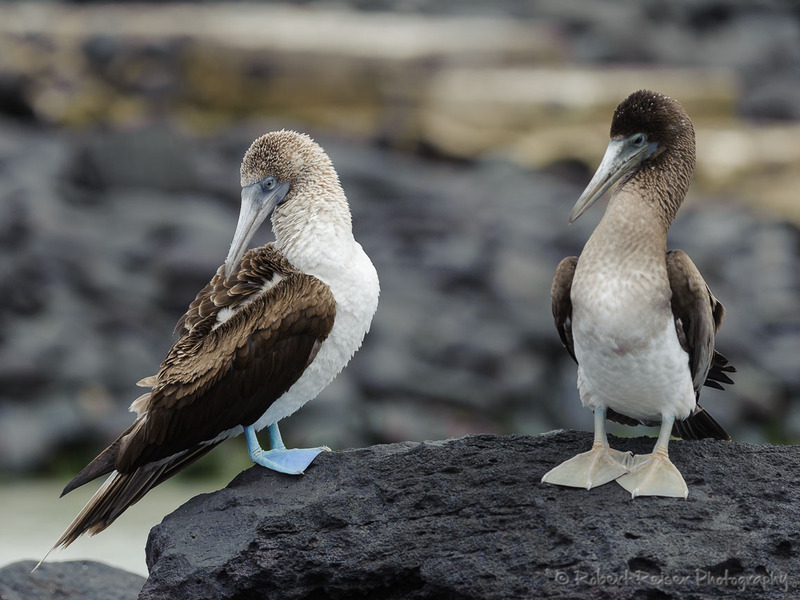 This is not a mistake - both are Blue-footed Boobies, but the Booby on the right is an immature one. It just started to develop the blue color on his feet. 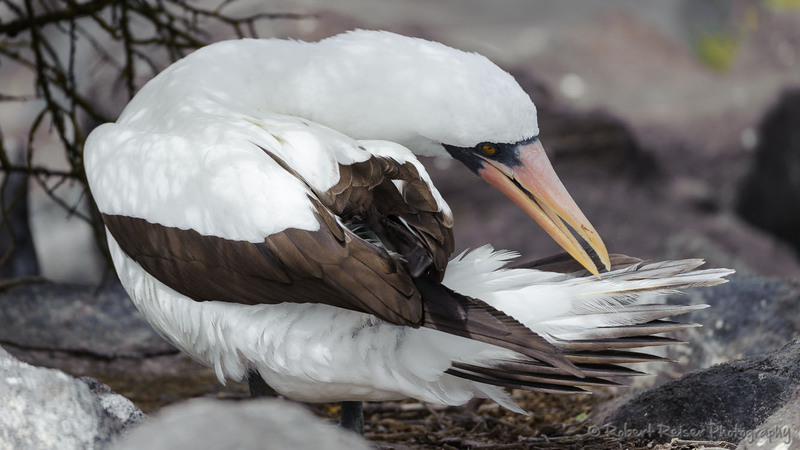 Finally, after the female returned to the nest, it offered food to the chick - which shoved its head down the throat of the female and picked up the food from the stomach. Only a couple of days old, this chick was anxiously waiting for the return of its parents, trying to hide as much as possible. 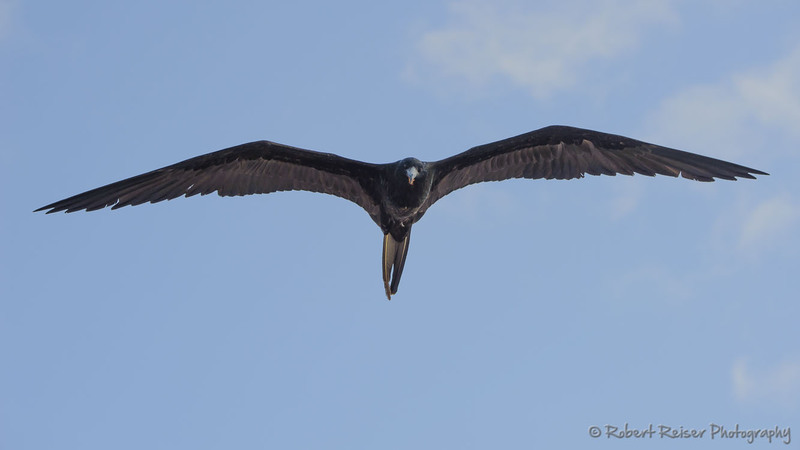 These impressive birds follow ships for a long time, and they can utilize thermics to hover in the air without moving their wings. Against a bright sky, their near-black bodies are really hard to photograph. 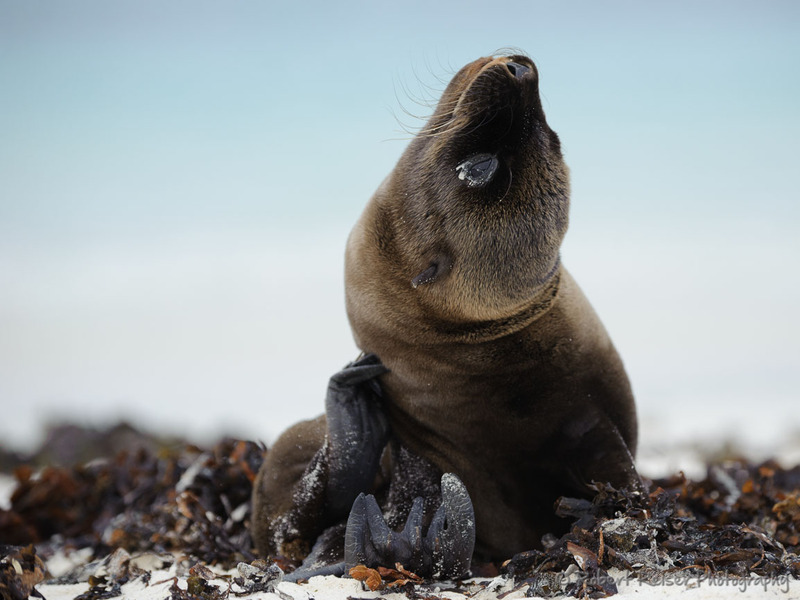 This seal puppy was waiting for its mother to return from fishing - it was really fun watching it trying to entertain itself. 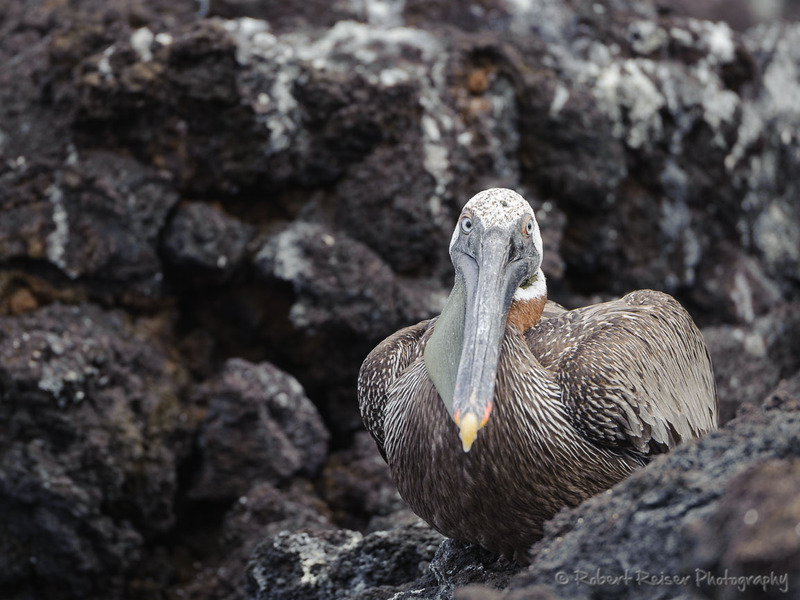 The Brown Pelican was hiding between rows of rocks, next to the sea, and I accidentially discovered it. This might perhaps explain its annoyed look. 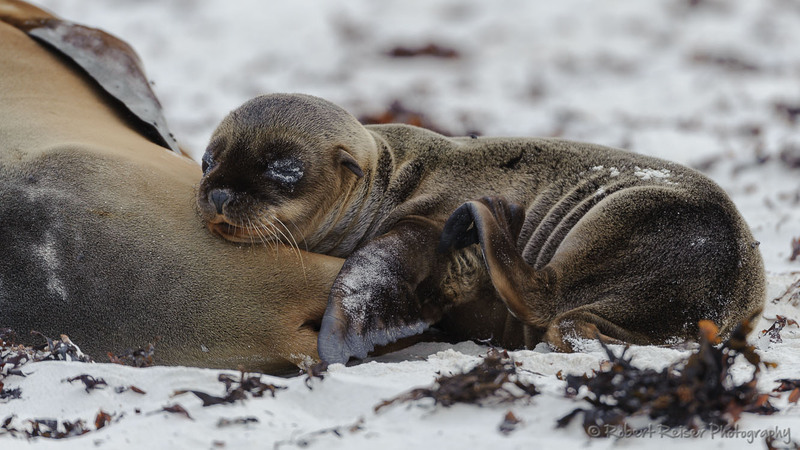 After receiving some milk this seal puppy had to rest and decided to cuddle up to mummy. 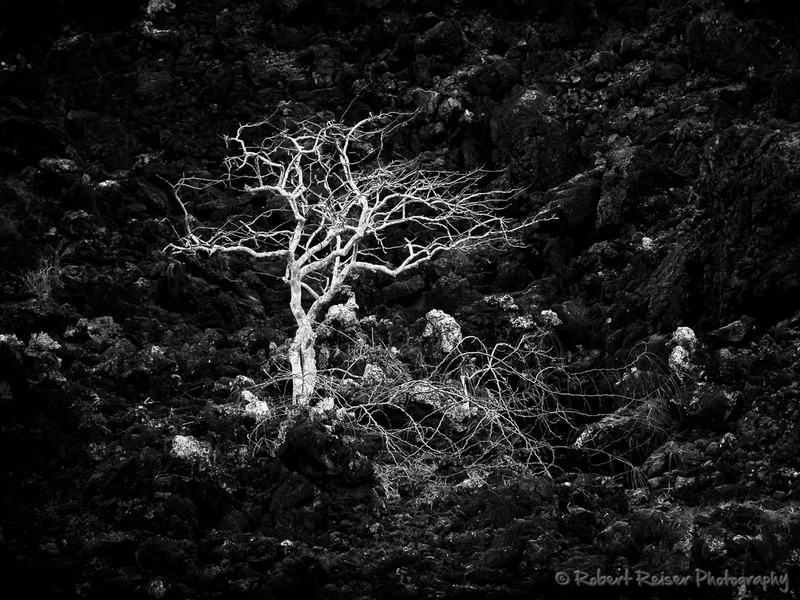 When I visited the island, the trees had no leaves on them, and their brightness stood out against the nearly black volcanic rocks. 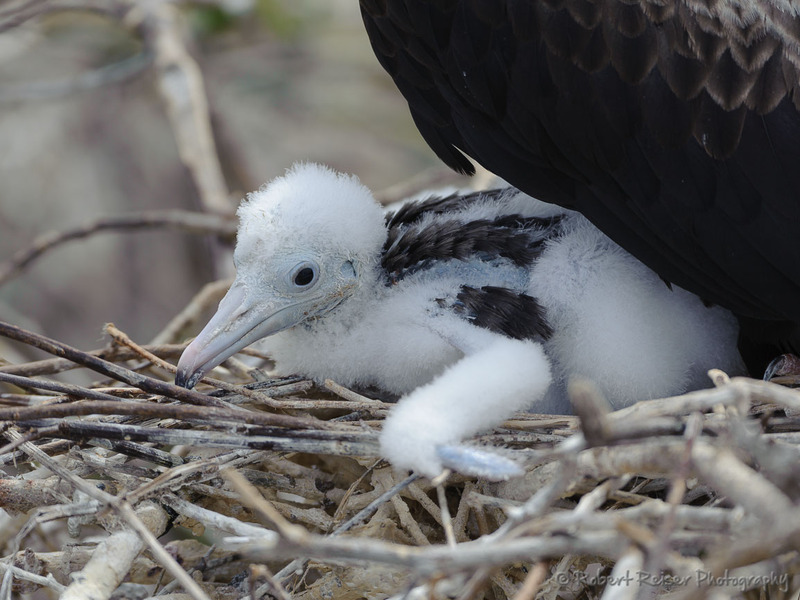 While the adults are mainly black, the chicks are completely opposite, mainly white with some black stripes on the back. 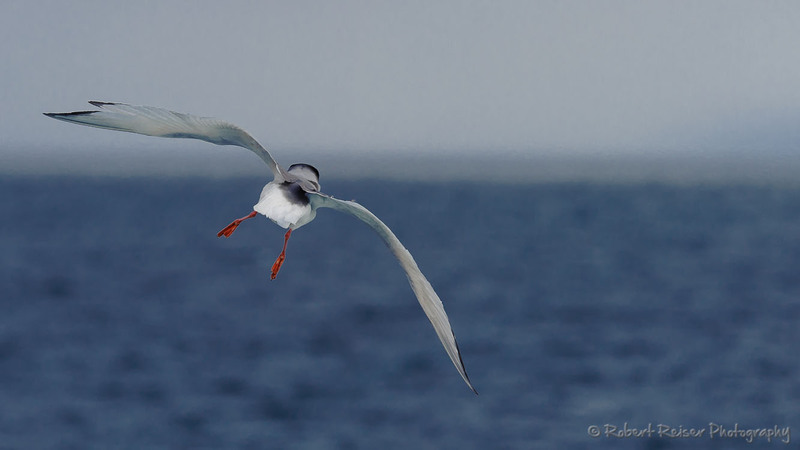 The wind was strong, and therefore most of the birds were carefully timing their landing approaches. This one was about to land three meters from my position. 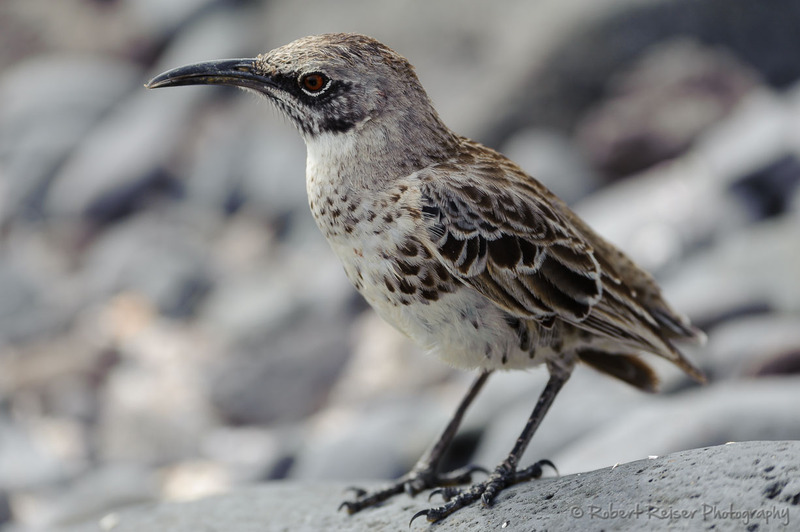 Being one of three different Boobie species on Galapagos, this one looks most closely like his European relatives. 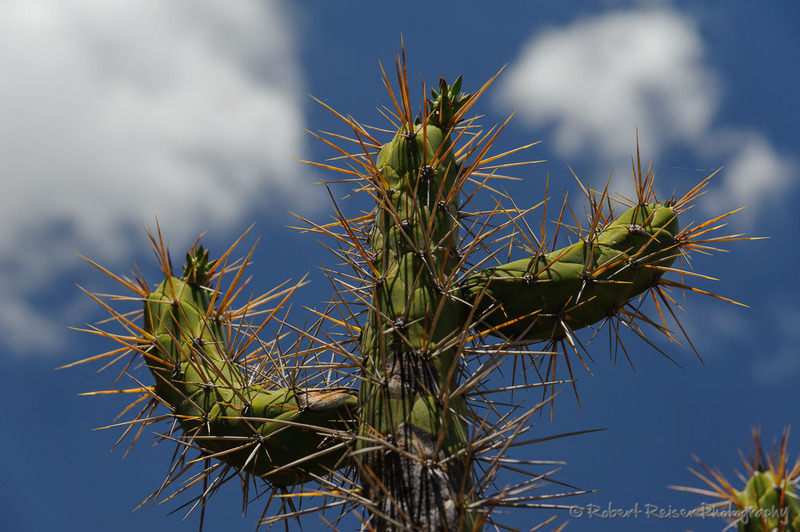 This impressive cactus was found near a former agriculture site in Cuzco, Peru. 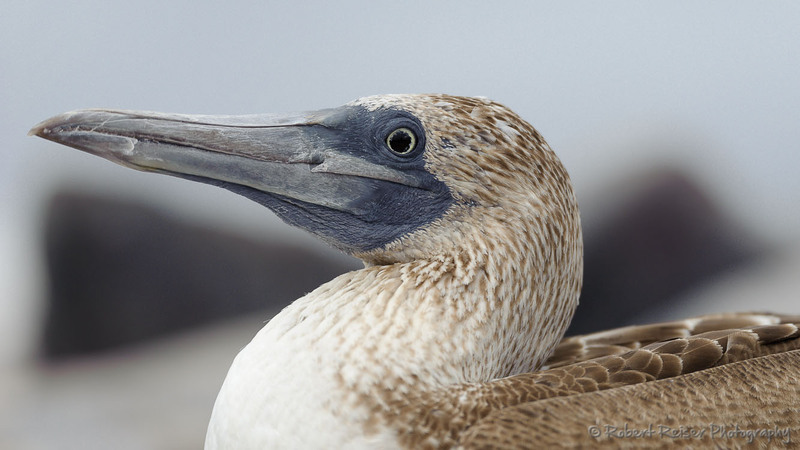 This portrait of a Blue-footed Booby is supposed to show in detail the beautiful markings and the blue bill. 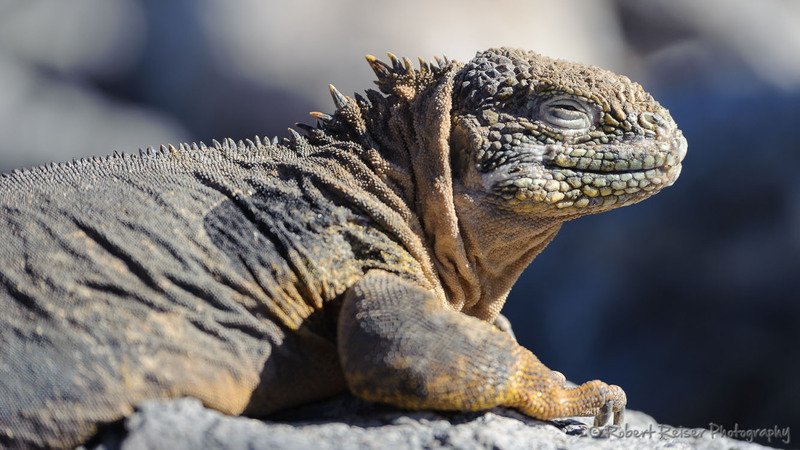 As cold-blooded animals, Iguanas are especially dependent on the warmth of the sun. 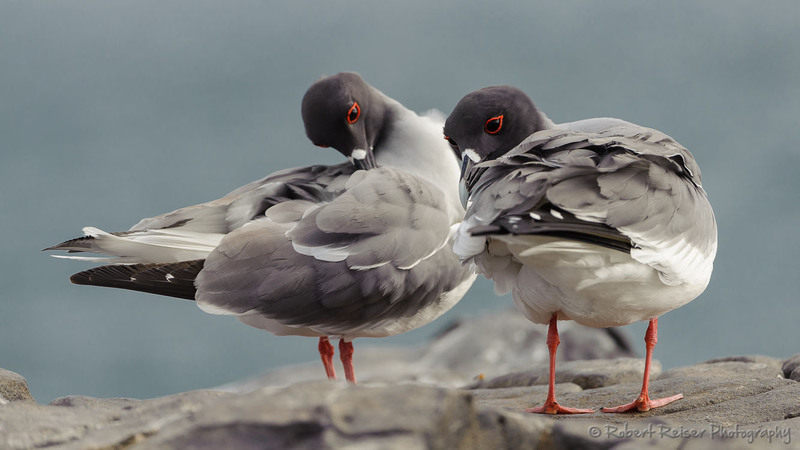 Right after sunrise, they re-orient their bodies to warm up as quickly as possible. 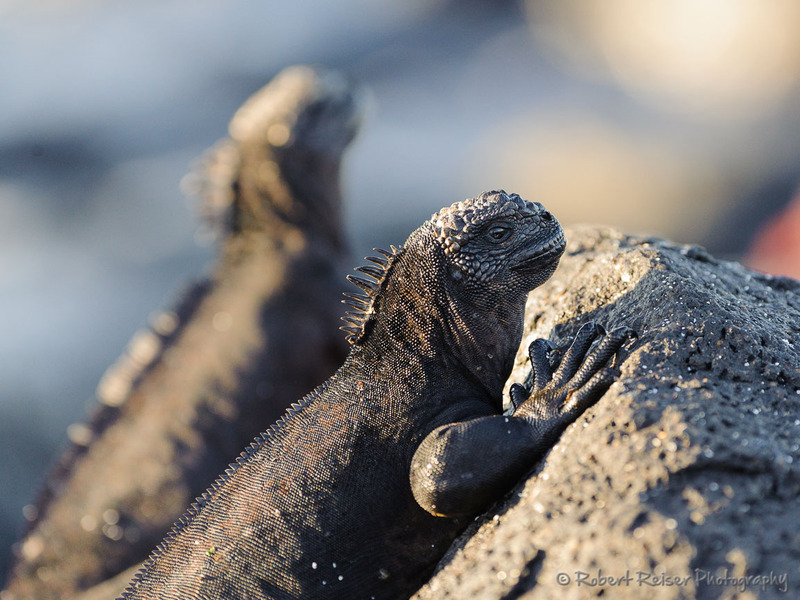 These Iguanas are a really perfect match to the volcanic environment of the Galapagos islands. 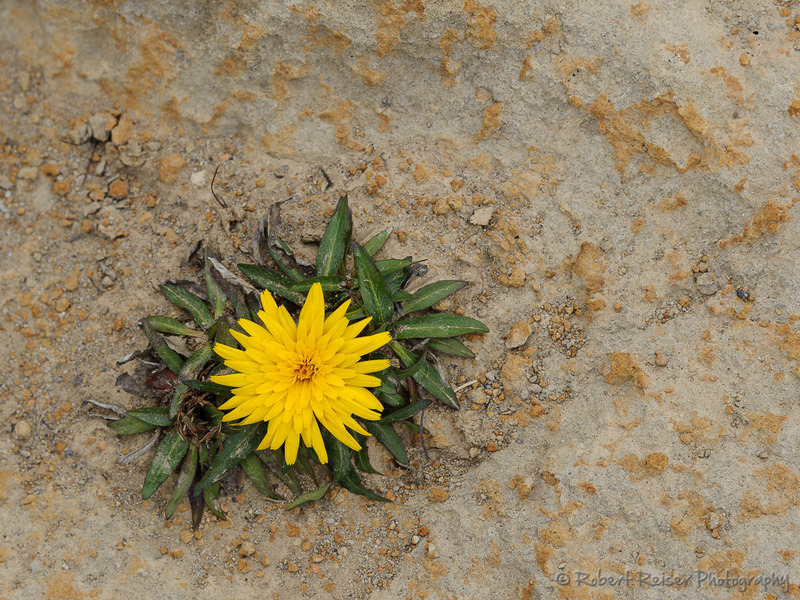 This dandelion was one of the few usable images from the Laguna Quilotoa in Ecuador - is was too foggy on that specific day. 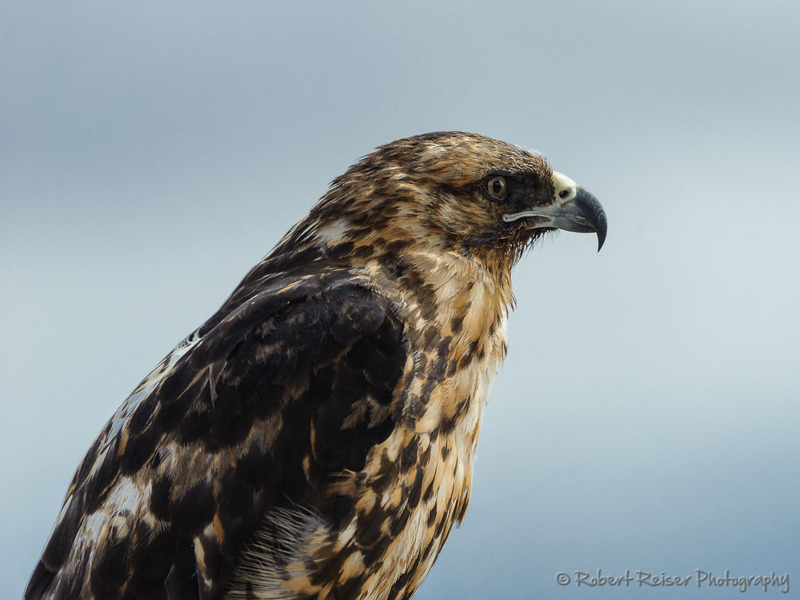 Nowhere else on the world would it be possible to approach a hawk so closely. It was watching for prey, recognising but completely ignoring any humans. 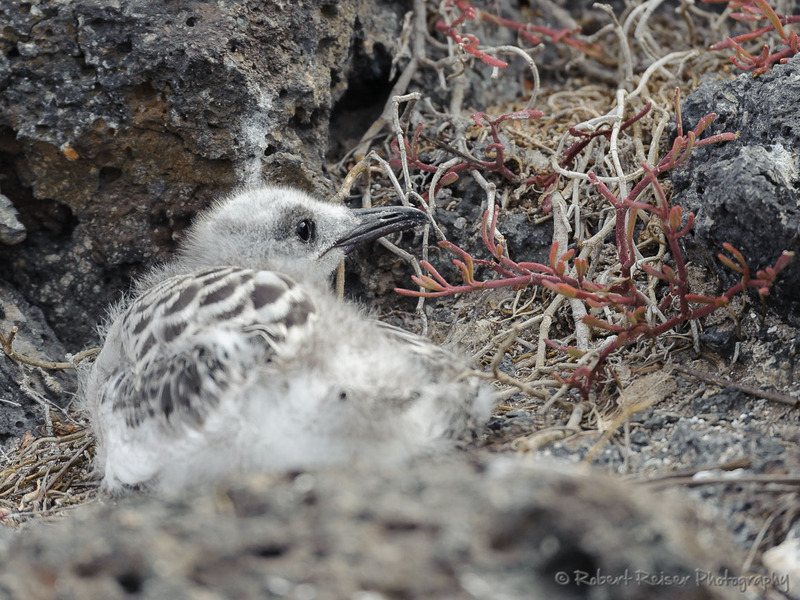 Pictures from a trip to the Galapagos Islands. 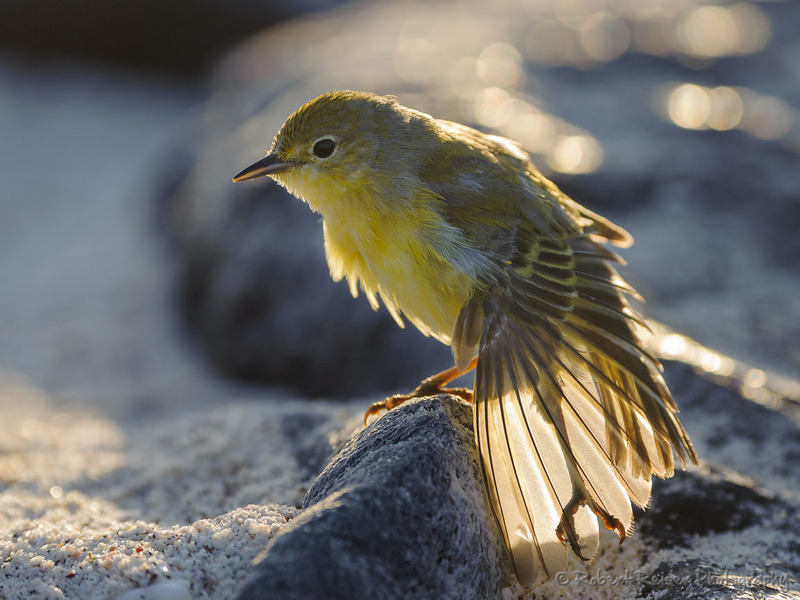 Galapagos offers unlimited photo opportunities, and I would like to share the amazing results. 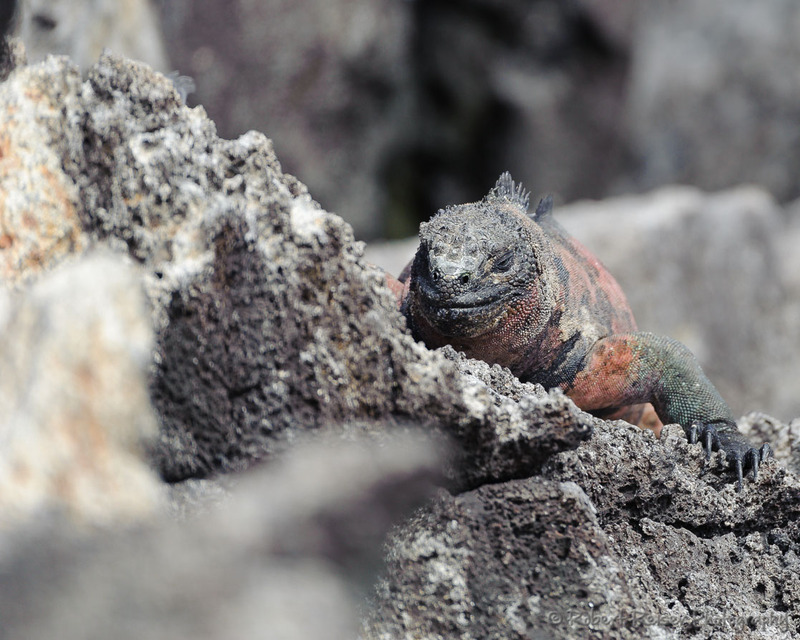 You may think you know a lot about the Galapagos Islands. My personal take is this: before you haven’t experienced it personally, you cannot really understand and appreciate what it is about. You are walking between animals who are not afraid of humans. 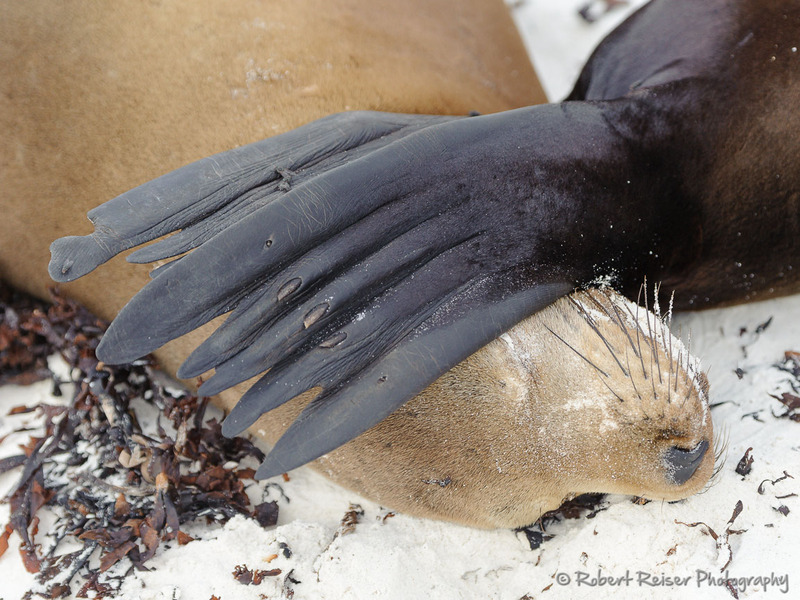 You watch them from an incredibly close distance, actually you could reach out and touch them (which is forbidden). I am not aware of any other place where this would be possible. At the same time, the variety of animals is simply overwhelming. 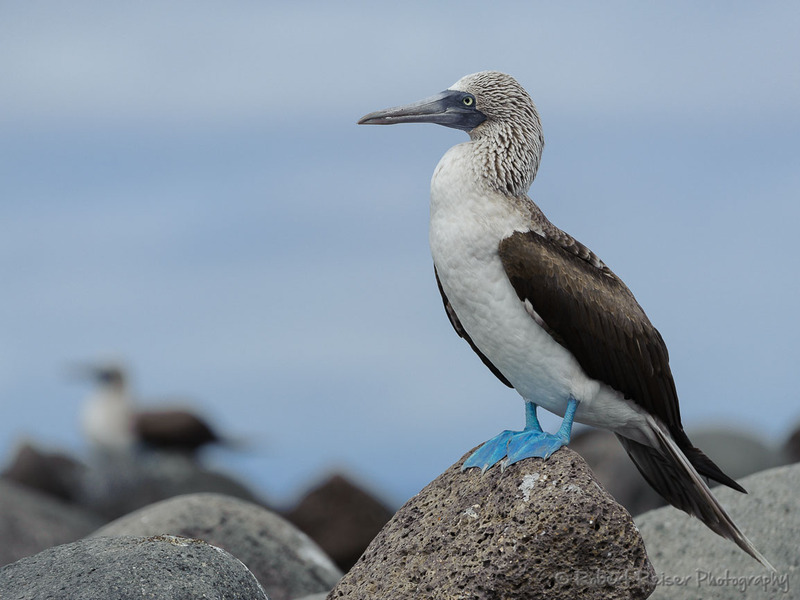 Plus, you will see animals that can be found only on the Galapagos Islands. I can say without exaggeration, that this was one of the most impressive trips of our lives so far. We have already decided to return at some point in the future, to explore the remaining islands we were not able to visit this time. I just hope that the conservation efforts will help to keep this area protected for a long time. These rules will hopefully in the future allow a lot of people to enjoy the beauty of what I would consider nature’s last paradise on earth. If you are interested in nature or wildlife, this place needs to be on your list of places to visit. Today, many people choose to be isolated and separated from the world around them. Sicilian Balconies is a visual reminder of this trend. 2016 pictures is a gallery summarizing the year – taken in Lobau, Vienna, in Tuscany, Italy and in the southeast of Styria, Austria.